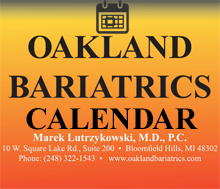 There are three different types of Bariatric surgery. The restrictive component modifies the stomach into a 3-4oz. (approximately 80cc) pouch reducing food intake. The malabsorptive component bypasses part of the small bowel (approximately 60%) causing a decrease in food absorption.